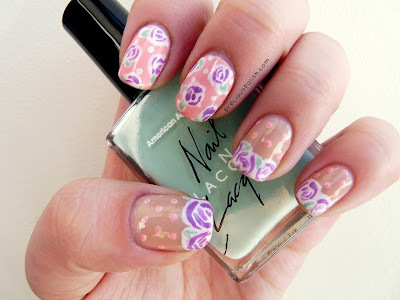 I have yet another floral manicure on my nails. Someone stop me, please. This is actually a copy of a look I did last year, Vintage Roses. I wanted to use a different colour scheme this time but I kept being drawn back to the original, so I changed things up by using the print as an accent instead of a full manicure. I don't know if I've ever done an index-middle accent combo before. I'm a pretty generic ring-thumb kind of gal but I like this accent too. On my index and middle finger I started with Essie Van D'Go. For the rest of my nails I used American Apparel Dance. I used American Apparel T-Shirt and a large dotting tool to outline the shapes of the roses and leaves. Then I took a striping brush and Essie Play Date to paint the roses and American Apparel Office for the leaves. To finish off the look I used a small dotting tool to make some polka dots. What do you think of the index-middle accent nails? Show me yours in the comments below or tweet @preciouspolish! January has definitely gone by quickly! I can't believe it's pretty much over! Aw I love your rose bud manis! So pretty! I don't mind to see all the florals since it's still dark & cold outside. ^.^ Love the way you draw the roses, looks so cute! Thanks, Karen! Haha that's a really clever idea! Yep, and now we're almost halfway into Feb! ): Thank you!